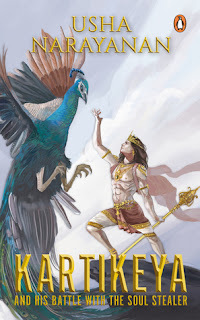 Mythological stories most of us have heard since our childhood back in India. From our Grandparents, Parents, Uncles, and Aunts. Picking Usha Narayanan’s book is always a trip back to those storytelling sessions. Very nostalgic! Except here we have more details and nuances which either we would have forgotten having heard or was not a part of the narration we heard. The extensive research she has done to collect all the information on the deity who is known with different names in different parts and very many stories about him has brought this book alive in a readers mind. Every book of Usha’s I’ve read is beautiful. This is my third book of Usha Narayanan. Karthikeya gives a lot to envision and savor. Here in this book the wars and violence were heart-wrenching. Some images are going to haunt me for ages. Usha Narayan's imageries of war are very very vivid. All in all, it’s a great read. Grab the book from here.